Bronx lyricist Chris Rivers has developed his reputation as one of the young MCs on the circuit to keep a keen eye on. A string of solid mixtape releases and heavy feature verses has found the East Coast MC steadily building his acclaim and respect amongst peers and listeners alike. Renowned for being the son of legendary rapper Big Pun, ‘Delorean’ is his debut album release, and it finds him carving out his own niche across the lengthy project. Opening with the textured, energetic title-track, Chris Rivers sets the tone of the uptempo, dense sounds found across this debut project. Intricate writing and precise flows are exhibited over a rowdy, synthetic production that is perfect for Chris’ complex structures. ‘Bag’ finds the east coast wordsmith embracing the current sound for a relentless, banger beat, and Rivers’ confident delivery makes it a definite success. ‘Chris Time Zone’ is the first in a series of short, boom bap cuts that break up the album, and the rapid-fire spitting is solidly in-pocket, and the soulful beat is head-nodding hypnotic hip-hop at it’s best. The smooth flows of ‘Old Thing Back’ are silkily executed; the radio-friendly cut is still packed with hip-hop sensibilities (just listen to the great hook, performed by vocalist Lydia Ceaser), and it’s a testament to Chris Rivers’ authenticity that this is delivered so impressively. Frequent collaborator Whispers kills his feature on the second in the ‘Time Zone’ series, and the melodic delivery and punchline-laced lyricism makes this a dope, short-knit appearance. Rivers recruits a selection of New York legends for the brilliant ‘Fair One’; Lil Fame, Sheek Louch and Styles P destroy the classic, hard-hitting boom bap beat with a series of forceful verses. Rising New York spitter Oswin Benjamin features on the third and final installment of the ‘Time Zone’ series; his laidback tone is infused with charisma, whilst maintaining heartfelt emotion in his delivery throughout the two-minute track. Oswin also appears on the following cut, ‘No Gives’. Skippy flows fall over a simplistic, trap-infused beat, and the mixture of traditional influence and modern direction is a fitting vibe for the ‘Delorean’ name. The LP still manages to maintain it’s cohesion, and for a debut project, it was definitely an ambitious undertaking. Decauter rapper Jarren Benton kills his feature on the standout ‘Nothing’; the two lyricists weave seamlessly with frantic bars over an intense production. 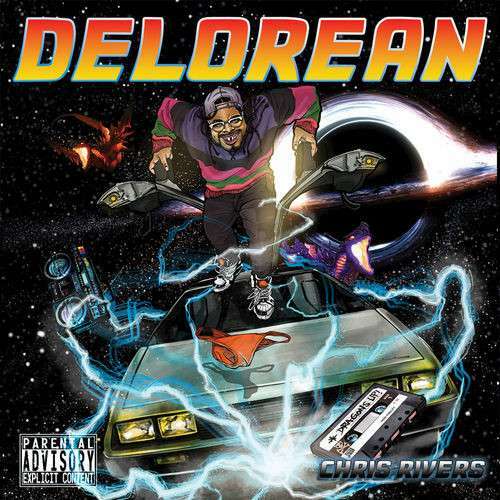 Chris Rivers exhibits an eclectic ear on ‘Delorean’, and the varied approach makes the ride far more entertaining than your average trip. The LP is populated by one or two many interludes, but the dense lyrical approach, classy production and consistent quality makes this an impressive first outing for the Bronx MC.